Aussie singer-songwriter Gotye’s “Somebody That I Used To Know” has become a bona fide global hit, thanks in part to the striking video and an inspired, mind-bending cover by Walk Off The Earth. 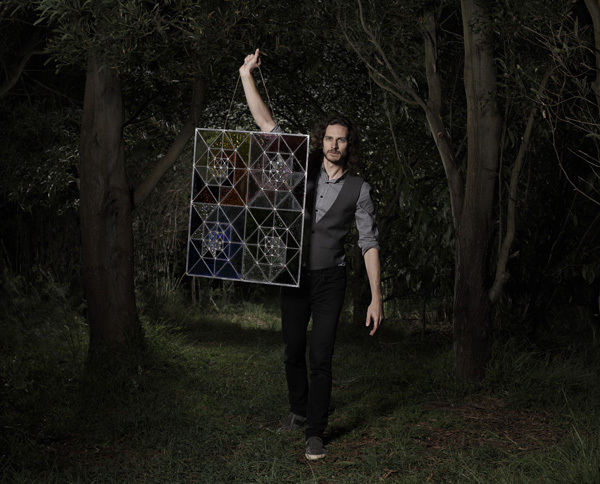 Gotye’s album Making Mirrors has just been released stateside. We talked to the Belgian-born artist about his love for Depeche Mode, his approach to songwriting, and more. I was about 15 or 16. I started scribbling lyrics down and tinkering with the family piano. Were they good right away? Oh no. They were pretty bad. And even some of the things I’ve written in the past year, sometimes, I go “Oh god, they’re terrible.” So it’s always a gradual process. In my teenage years, Depeche Mode. As a songwriter, Martin Gore had a huge influence on me. I spent my first three years teaching myself harmony by discovering chord progressions on the piano – a lot of it by trying to work out Depeche Mode songs. For a long time, I borrowed a lot of Martin Gore’s very heavily minor chord-based harmony approach, and his vocabulary. I sang a lot of his songs in my high school band. When I turned 20, I had to consciously broaden my horizons and move through that, and not let myself kind of rot in that imitative style. What was the last song you wrote? I haven’t really completed anything since I finished the record. So it might be “Making Mirrors,” a little piece that opens the album. But the last main song I wrote was “Somebody That I Used To Know”. When you wrote “Somebody That I Used To Know,” did you sense that it was going to be a hit right away? I had a good feeling about it, but no. It completely exceeded expectations. I didn’t think it would have a pop crossover aspect as strongly as it’s had. What would you say is the reason for its success? People seem to respond to it just as a song, regardless of whether it’s my voice or the production or the fact that Kimbra is on it. The Canadian band Walk Off The Earth’s version — apart from the clever novelty aspect of five people playing one guitar to it — that kind of shows people seem to really respond to the song. I think it’s the kind of slow build and drama that it has, the two-part story, and the multiple perspective aspect that has struck people. It’s written openly enough that it expresses that confusion you can have after a broken relationship, and the way you can feel emotionally quite up and down. You can feel nostalgic and rosily melancholy, in a way. But sometimes we often feel quite bitter about things, when you have nothing to do with that relationship or maybe with that person anymore, at least not actively. It can be quite a confusing feeling. So maybe the way the song expresses those feelings appears to strike people as quite true, and quite relevant with their experiences. What did you think of Walk Off The Earth’s cover? It’s very faithful, obviously. The concept behind the video is fantastic. It’s great – it makes you laugh, as well. Especially the guy holding the machine heads at the end of the guitar. What’s a song that you really want people to hear on Making Mirrors? One of my favorites is “State Of The Art”, which I think probably will divide a lot of listeners, especially the wider audience who have discovered my music through a song like “Somebody That I Used To Know.” I get the feeling that a song like “State Of The Art” confounds some of those people, whereas others really take to its peculiarity. I would love to see a song like “State Of The Art” be a hit single, because I think it’s quite catchy and it’s written like a pop song for me, but in that way that I’d like to see more pop music be — very idiosyncratic, kind of strange, and requiring a little bit of understanding about what the hell the concept behind it is. Those are the things I think are the strongest about it. But they’re also the things that turn a lot of people off about it, apart from maybe the vocoder talk box voice on it. What’s a lyric on the album you’re particularly proud of? It might be “State Of The Art” as well. I feel like I can stand behind all the lyrics on the record, which is good. I’m proud of “Bronte,”the album closer. “Bronte” as a whole lyric I kind of like, because of its directness and the way it sort of captures an experience I had. It varies. I respond a lot to textures and sound itself. There’s been a few songs on this record that started with a melody or a lyric that had been floating around in my head, but often you kind of wait for that trigger from the break, or from even just a little instrumental canvas for a song that I’ve had floating around for a while. And then sometimes it just correlates with words or things that have been floating around in my head and then the greater concept of the possibility for a song develops from there. There’s a band in London that I’m a huge fan of called The Chap. They are some of my favorite songwriters and producers. here’s also a guy from Australia who operates under the name Machine Translations, and he’s very under-recognized in Australia, let alone anywhere else in the world, but he’s one of my favorite songwriters. What’s a song you consider to be perfect? Kate Bush’s “Cloudbusting” is a song I come back to a lot. It has a transcendent quality and I melt into every time I hear it.